Gardening requires walking in dirt, and mud, and gravel, and mulch — you get the idea. Garden shoes are work shoes, and they need to be able to hold up in rugged conditions and keep you comfortable. Since garden beds are wet — you might have heard of this thing called photosynthesis, which requires water — you’ll need shoes that can keep the damp out. Wet socks and damp feet are one of life’s truest miseries. You’ll also want a shoe that can keep your feet warm during the winter, early morning, or late evenings. Your feet play an especially important role in keeping your body warm. Soil and wet rock are slippery. Your shoes must keep you upright and steady, even when you’re climbing a pile of rocks or turning over a bed of soil. Plus, good tread is ergonomic: If you’re confident that you have a good foundation, you can use your legs more. As you know, using your legs is the healthiest way to do heavy lifting — and schlepping bags of soil, yard waste, or fertilizer definitely qualifies as heavy lifting. Shoes with good tread save your back. In the same vein, good arch support is critical for your long-term physical health. Good shoes help your legs, knees, and back stay healthy. They’ll also make your movements more efficient. Remember — gardening involves much more than kneeling in a planter box. You also need to haul, shovel, rake, hoe, and sweep — all of which require a standing position. Good support will make those labors easier and less tiring. The least expensive garden shoes we’d recommend are old sneakers. The cost is low because you already own them. The most expensive garden shoes on our list are the Hunter Chelsea Boot. The cost is high because they’re boots rather than shoes, and are made out of durable rubber. There are major advantages to using old running or gym shoes in the garden. One, you won’t waste useful stuff. We’re all for that around here. Two, you’ll save money and space. Still, there are drawbacks, and you probably already know what they are. Old shoes tend to have worn out arches and treads. Most cross trainers and running shoes don’t have any sort of waterproofing. Some popular sneakers, like Chuck Taylors, are inappropriate for long periods of hard work. However, a good pair of performance running shoes or basketball or tennis shoes will serve you well. A friend of mine who owns and operates a landscaping business (and is the biggest UNC hoops fan I’ve ever met) wears his oldest, dirtiest pair of Jordan Ones on the job, and he’s doing great. Crocs are a work shoe that you’ll see in all kinds of damp and slippery environments, including professional kitchens. They perform well in the garden, too: They’re lightweight, have good arch support, and a good grip. While they won’t stay wet for long, they also aren’t going to keep your feet dry. They also won’t keep them especially warm, either: there are holes in the lowest-end Crocs. These shoes are also the least durable of any that we reviewed. That being said, reviewers on Amazon love that crocs are super comfy and easy to clean. They’re a great shoe for running errands, taking the dogs out, and of course, cleaning up the garden beds. Dansko clogs will last forever, are completely waterproof, and will hold their grip in any context, no matter how wet or greasy. They will keep your feet very warm. However, Danskos do take a while to break in. Their support is excellent, but it will take a lot of use to make these shoes as comfortable as they will eventually become. These shoes are a long-term investment for a dedicated gardener. Many reviewers wear these as work shoes, where they’re standing on their feet for upwards of 12 hours. Those reviewers mention that their feet stayed supported and dry, no matter what kind of work they were doing. 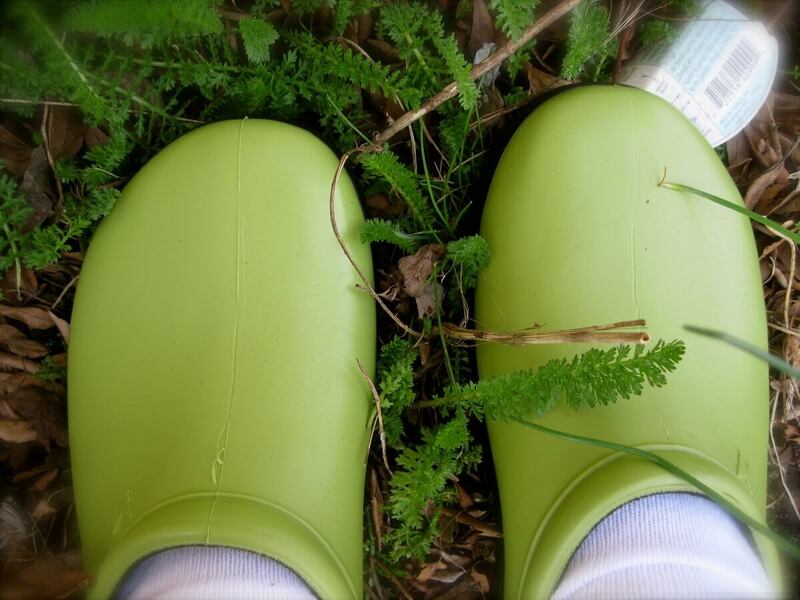 Another reviewer mentioned that the clogs don’t slip off unintentionally as she feared that they would and that her feet felt comfortable and secure. Possibly the most common gardening shoes, sloggers are well-loved by many gardeners, chicken keepers, farmers, and the like. They stand up well to mud, muck, dirt, and everything else and will last for many years to come. The waterproof exterior ensures that your feet will stay dry, and the lined fabric helps keep your feet sweat and slip-proof. And I mean, ‘cmon, the chicken pattern on these is so cute! One reviewer is a flower gardener in the Northwest and says that these boots stand up to a whole day’s worth of rain, mud, and nasty weather. She mentions that the boots are lightweight and flexible, providing you with a good balance of protection from the elements and maneuvrability. Another reviewer adds that these boots have great traction and arch support, and can take on everything from gravel to grass to mud with ease. Jolly clogs are Crocs’ grown-up cousins. They are a more flexible version of work clogs like Danskos. Jollys have a very good grip, and their polyurethane plastic is of much higher quality than the plastic in Crocs. Their support, waterproofing, and heat retention all score highly, especially when compared to Crocs. One reviewer mentions that these clogs are great for sloshing around in the mud while still keeping your feet totally dry. Hunter is a well-loved and respected rain boot brand. All they make are boots that are extremely waterproof and durable. Their Chelsea boot, also known in the U.K. as a Wellington boot, is made with gardeners in mind. It is easier to take on and off than most rain boots, but won’t slip on and off like a clog. The tread is good. The Chelsea boot is not as ergonomic as the above clogs, but it is sympathetic over a long day gardening. The boots offer better water protection than any other shoe reviewed here and will last forever. While some reviewers mention that these boots are difficult to get on and can be rough on the ankles, others mention that using thick, tall socks helps to protect your feet. Another reviewer mentioned that these Hunter boots are easy to clean off and keep your feet nice and dry in rainy, wet areas.